The World Health Organisation (WHO) noise guidelines are highly influential but their application often leads to disagreements. Lisa Russell reports. Consultants and local authorities alike have examples of situations where they feel the other party has misinterpreted the World Health Organisation's Guidelines for community noise. Sometimes the claim is that they are being applied so rigorously that worthwhile developments are scuppered; the alternative argument is that they are being twisted to force through schemes that should never be allowed. Community noise is dominated by transportation. Road traffic noise in particular affect a lot of people, while aircraft noise causes high levels of annoyance for those on the flight path. World Health Organisation (WHO) noise guideline values were first published in 1980 in Environmental health criteria 12. The current guidelines were finalised in 1999 and are based on a 1995 document prepared for WHO by Stockholm University and the Karolinska Institutet. In turn, the guidelines influence key documents, including BS8233 Sound insulation and noise reduction for buildings - Code of practice and PPG24 Planning and noise. Values from both the 1980 and 1989 documents are also often cited directly in relation to individual cases. England's PPG24 and Scotland's PAN56 makes direct reference to WHO, while BS8233 presents guidelines for recommended noise levels in various circumstances and sets "reasonable" standards the same as the 1980 WHO levels and "good" as the 1999 ones. The values are commonly used by local authorities in setting their targets, says Faber Maunsell's Dani Fiumicelli, with a trend for more local authorities to adopt the "good" levels. The value in the 1999 guidelines is specified as 30dB LAeq, for continuous noise for an eight hour time period "if negative effects on sleep are to be avoided". In 1980, a value of 35dB LAeq, was given for bedrooms and this was aimed at avoiding "interference with the restorative process of sleep" by continuous noise. The 1999 guidelines also give an additional LAmax guideline of 45dB to cater for the situation where there are individual noise events. Different external values are also given in the two documents. 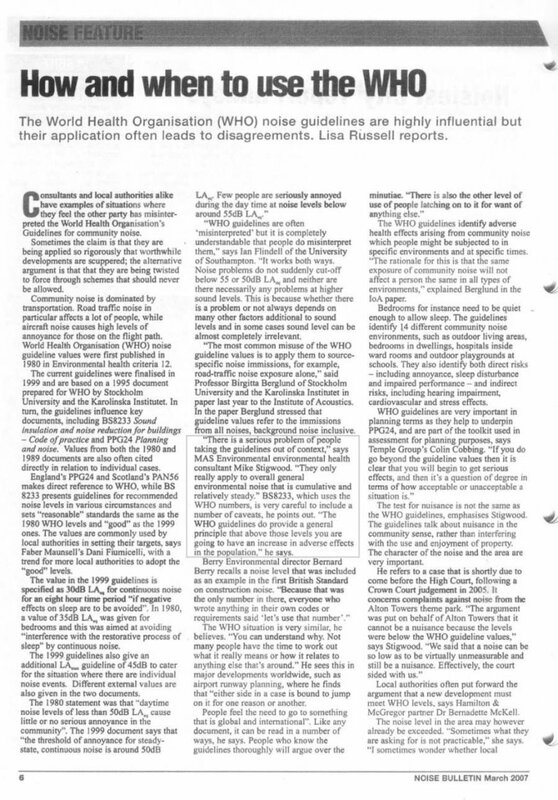 The 1980 statement was that "daytime noise levels of less than 50dB LAeq cause little or no serious annoyance in the community", The 1999 document says that "the threshold of annoyance for steadystate, continuous noise is around 50dB LAeq, Few people are seriously annoyed during the day time at noise levels below around 55dB LAeq"
"WHO guidelines are often 'misinterpreted' but it is completely understandable that people do misinterpret them," says lan Flindeli of the University of Southampton. "It works both ways. Noise problems do not suddenly cut-off below 55 or 50dB LAeq and neither are there necessarily any problems at higher sound levels. This is because whether there is a problem or not always depends on many other factors additional to sound levels and in some cases sound level can be almost completely irrelevant. "The most common misuse of the WHO guideline values is to apply them to source-specific noise immissions, for example, road-traffic noise exposure alone," said Professor Birgitta Berglund of Stockholm University and the Karolinska Instituter in paper last year to the Institute of Acoustics, In the paper Berglund stressed that guideline values refer to the immissions from all noises, background noise inclusive. "There is a serious problem of people taking the guidelines out of context," says MAS Environmental environmental health consultant Mike Stigwood. "They only really apply to overall general environmental noise that is cumulative and relatively steady." BS8233, which uses the WHO numbers, is very careful to include a number of caveats, he points out. "The WHO guidelines do provide a general principle that above those levels you are going to have an increase in adverse effects in the population," he says. Berry Environmental director Bernard Berry recalls a noise level that was included as an example in the first British Standard on construction noise. "Because that was the only number in there, everyone who wrote anything in their own codes or requirements said 'let's use that number'." The WHO situation is very similar, he believes. "You can understand why. Not many people have the time to work out what it really means or how it relates to anything else that's around." He sees this in major developments worldwide, such as airport runway planning, where he finds that "either side in a case is bound to jump on it for one reason or another. People feel the need to go to something that is global and international". Like any document, it can be read in a number of ways, he says. People who know the guidelines thoroughly will argue over the minutiae. "There is also the other level of use of people latching on to it for want of anything else." The WHO guidelines identify adverse health effects arising from community noise which people might be subjected to in specific environments and at specific times. "The rationale for this is that the same exposure of community noise will not affect a person the same in all types of environments," explained Berglund in the IoA paper. Bedrooms for instance need to be quiet enough to allow sleep, The guidelines identify 14 different community noise environments, such as outdoor living areas, bedrooms in dwellings, hospitals inside ward rooms and outdoor playgrounds at schools. They also identify both direct risks - including annoyance, sleep disturbance and impaired performance - and indirect risks, including hearing impairment, cardiovascular and stress effects. WHO guidelines are very important in planning terms as they help to underpin PPG24, and are part of the toolkit used in assessment for planning purposes, says Temple Group's Colin Cobbing. "If you do go beyond the guideline values then it is clear that you will begin to get serious effects, and then it's a question of degree in terms of how acceptable or unacceptable a situation is." The test for nuisance is not the same as the WHO guidelines, emphasises Stigwood. The guidelines talk about nuisance in the community sense, rather than interfering with the use and enjoyment of property. The character of the noise and the area are very important. He refers to a case that is shortly due to come before the High Court, following a Crown Court judgement in 2005. It concerns complaints against noise from the Alton Towers theme park. "The argument was put on behalf of Alton Towers that it cannot be a nuisance because the levels were below the WHO guideline values," says Stigwood. "We said that a noise can be so low as to be virtually unmeasurable and still be a nuisance. Effectively, the court sided with us." Local authorities often put forward the argument that a new development must meet WHO levels, says Hamilton & McGregor partner Dr Bernadette McKell. The noise level in the area may however already be exceeded. "Sometimes what they are asking for is not practicable," she says. I sometimes wonder whether local authorities fully appreciate the precautionary nature of the WHO guideline values - that's all they are, guidelines. Local authorities don't necessarily take into account the noise level in the area that the development is going into." In particular, existing houses may already be exposed to higher levels, she points out. Ealing Council sets its own design criteria: 50dB LAeq,1hr for gardens; 35dB LAeq,1hr for living rooms (which is half way between BS 8233's "good" and "reasonable"); and 30dB LAeq,1hr and 45dB LAeq,1hr for bedrooms. This guidance is not over-strict in the context of the other advice available, feels Cyril Pennington, a senior environmental health officer with a specialist role in noise and nuisance in relation to planning. The use of a one hour time period goes beyond WHO's use of eight or 16 hours. The reason for adopting one hour is to build a safety factor into the calculations, explains Pennington. The intention is that, in practice, 16 hour and eight hour values will be achieved. "We come across many inaccuracies in practice with theoretical calculations," he says. Stigwood finds that local authorities are facing considerable pressure from developers who are saying that the authority cannot object if the levels are below the WHO guidelines. "The guidelines can be used by consultants to meet their own ends," says South Northamptonshire environmental protection officer John Penny. He recalls a case involving a grain drying unit where WHO values would be inappropriate. A consultant was trying to get the development to go ahead, using arguments and a report based on assessment against the WHO guidelines. "I was saying that it needed to be tested in accordance with BS 4142." Some local authorities do not have the expertise or resources to push noise issues, Pennington adds. Developers are using guidelines and ambiguity to their own ends, he says. "This may sound cynical, but developers are in it for the money and not the good of the new residents," he says. Newham wouldn't prohibit building on noisy NEC category D sites, says lead environmental health officer Robin Whitehouse, but it would ire a noise report prior to construction to show that a reasonable development could be made there. Whitehouse points out that insulation has improved since the C and D bands were defined. People would be asked to produce "good" under BS8223, but the policy is flexible. As a fallback, they would certainly have to achieve reasonable, he says. Parts of the borough near London City Airport could have an Lmax problem using the criteria, perhaps failing to meet the "good" standard in BS8233 because of one or two early flights. "We adopt a flexible approach and will look at the whole development. There may be a situation where two or three buildings out of a whole development might just fail to meet 'good'." In a large development, at least some of the amenity areas should meet the standard, says Whitehouse, and some of the noisier spaces might have other attractions, such as good views of the airport runway. A rigid and inflexible application of the WHO guidelines can present significant problems in achieving the objectives of sustainable residential re-development of brownfield land, believes Fiumicelli. He and colleague Nigel Triner presented a paper to the Institute of Acoustics, exploring whether the guidelines were a help or hindrance to sustainable development. Noise is an inevitable consequence of a thriving and flourishing economy, they said. "It should be possible to permit some noise-sensitive development on a case by case judgment of the merits of each proposal, provided the final noise conditions are controlled so that significant negative impacts are unlikely." Fiumicelli refers to a case concerning planning permission for a site categorised as NEC D under PPG 24. 'Noise issues were to the fore though planning permission was eventually refused on appeal on other grounds. The inspector's report did however discuss the noise issues. Some external noise levels would have exceeded the 50dB LAeq,1hr set by the local authority's policy, but the inspector felt there would be some justification in considering instead the higher figures from PPG24. Internally, no habitable rooms or windows would overlook the busy dual carriageway and the inspector felt that acceptable levels could be obtained with windows closed at night. The development would also have reduced the noise for some existing residents, by providing screening. Ealing's Pennington regrets that there has been a focus in meetings and seminars about local authorities being wrong in setting what they feel are rightful and good standards for their residents. There has, he says, been very little talk, if any, about the known inaccuracy of calculations and models and how to put this right. "There is widescale abuse of objective noise rating procedures," believes Cobbing - and this is not restricted to WHO. Cobbing encounters situations where objective procedures are used far too slavishly. "A lot of noise consultants think that you can only make objective judgements about noise nuisance if you use objective criteria, more often to the exclusion of all of the other tools which are available." "People get so absorbed in the maths, the readings and the technology that they often lose sight of what they are trying to do, which is to use numbers to represent the noise in as accurate and objective a manner as possible," is the personal view of Telford & Wrekin Council environmental health team manager Tony Higgins. A number or series of numbers will not necessarily describe the nature of the noise or where the readings were taken and arguments often start because the numbers can be interpreted a hundred different ways, he believes. He is also concerned by an increasing use of predictive noise modelling programs, which produce results that cannot readily be checked. "A potentially disastrous noise problem can appear on paper to be acceptable because of an inconsistent use of a model. Conversely, developments that should go ahead may be quashed." 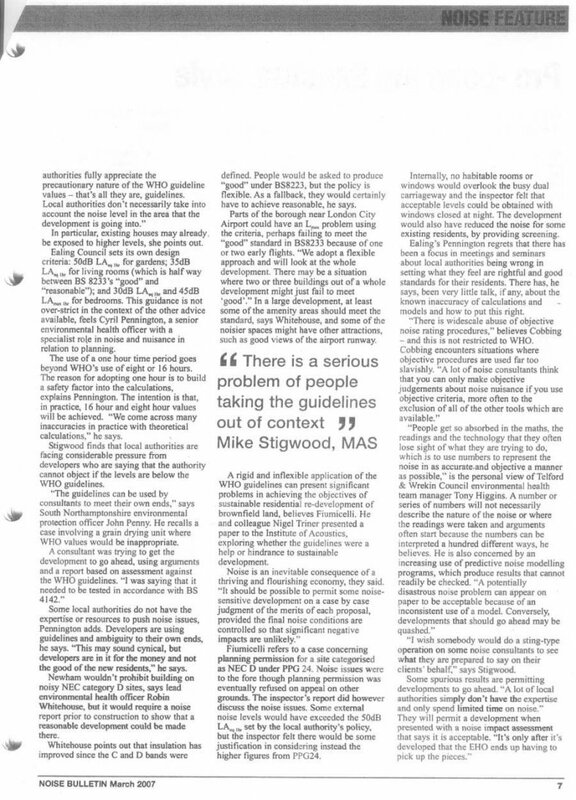 "I wish somebody would do a sting-type operation on some noise consultants to see what they are prepared to say on their clients' behalf" says Stigwood. Some spurious results are permitting developments to go ahead. "A lot of local authorities simply don't have the expertise and only spend limited time on noise." They will permit a development when presented with a noise impact assessment that says it is acceptable. "It's only after it's developed that the EHO ends up having to pick up the pieces."